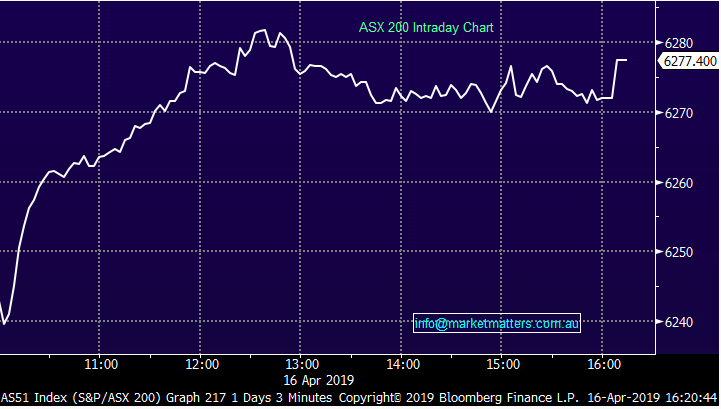 The ASX brushed a weak overnight futures read early in the session as the banks caught a bid for the third day in a row. The buying caught a second wind mid-morning around the time of the RBA Minutes release. There was a significant change in tone from the RBA board with central bank pondering what it would require to move to cutting rates. Despite not seeing any need to drop rates in the short term, house prices continues to get a mention with the weak housing market having a significant impact on spending despite strong employment data which has been supporting the local economy. 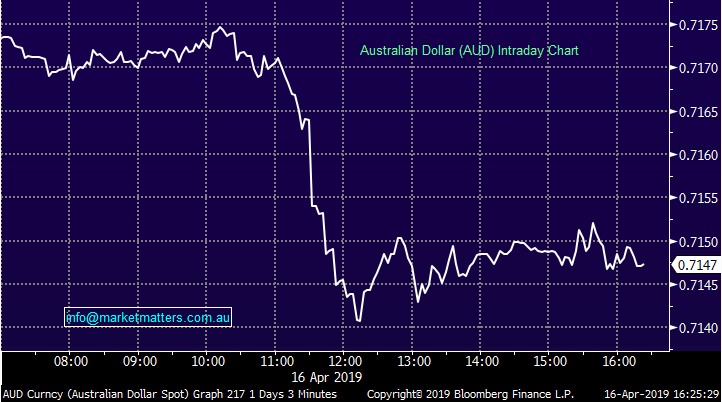 The RBA also called out the currencies impact on inflation with the preference for a lower dollar to help activity pick up – traders saw this as an opportunity to sell the AUD but buy the ASX and there was some strong intra-day moves around the release at 11.30AM. 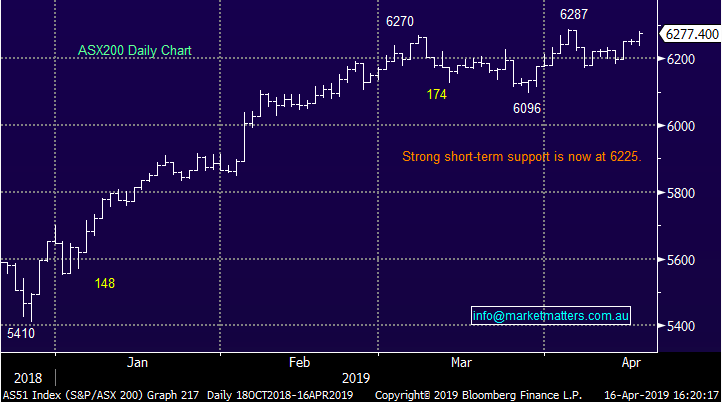 On a sector level, the consumer facing stocks saw some buying on the back of the RBA comments, however it was healthcare which again took out top spot thanks buying in heavyweight Cochlear (COH) – we look at why they moved higher today later in the report. 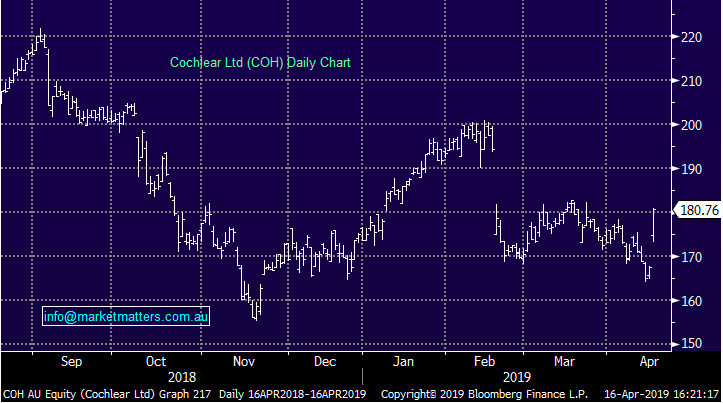 Cochlear (COH), +7.86%, tested and held the $180 level today thanks to a new product hitting the market. The Nucleus Profile Plus range is an advancement on some of its current range and is now available in Germany while Cochlear await regulatory approval to expand the offering globally. The new product allows patients to have an MRI without the need to remove the core parts of the device. We are on the sidelines here, selling prior to the half year result which saw the stock tumble soon after – the market now buying back into the growth story here with a large addressable market and a clear foothold in the quality end of the hearing space it is certainly a quality stock which can be bought for the right price. 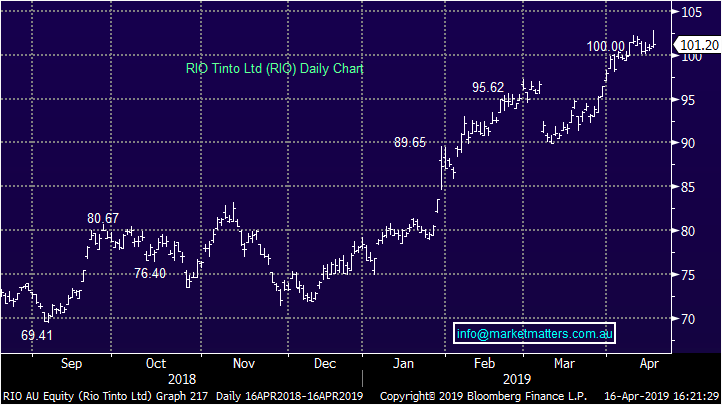 Rio Tinto (RIO), +0.45%, traded only marginally higher today, but well outperformed other iron ore names which traded lower, on the day RIO posted its quarterly numbers. Iron ore production was impacted by the cyclone which tracked over Western Australia late in the quarter and Rio was forced to lower production guidance again as a result. However this was the only blip on the scorecard, and one the market was expecting given the recent change in tone around guidance. Copper, aluminium & mineral sands production, among a number of other products, are all tracking well and no changes to any other guidance. We do like Rio but find it hard to buy in at these levels. We recently wrote “this a market with many strong driving fundamental issues with the previously mentioned Vale supply the most important this year, sharp 10-20% pullbacks is almost common for the commodity and it could easily be far more if Vale were to just hint at returning some decent supply in the future – our ideal buy price for iron ore is ~15% lower, from a risk / reward perspective we cannot chase at today’s prices.” – Read the full iron ore report here.